The foundation stone I discovered I had been missing was the purpose behind all of the postures. Simon Thakur shared that one of the core functions of yoga is about increasing awareness throughout the body with a particularly important focus around the central axis of the body, between the spine and the organs. From here, a fundamental aspect of yoga practice can start with the awakening of our ability for the spine to undulate backwards and forwards, undulate side-to-side and to twist – and awakening this ability in each individual vertabrae. This was the foundation stone I was looking for. Like going back to the beginning of the television series I’d started watching in the middle, I suddenly saw new depth and had a more complete understanding of everything I’d already seen so far. 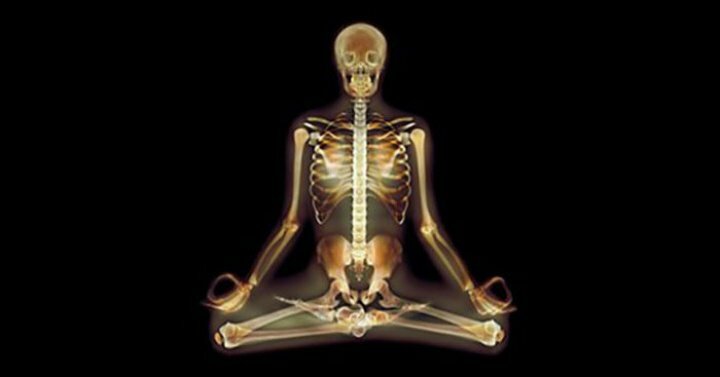 For example, it suddenly occurred to me that this opening of spinal flexibility and increase in strength helps one to sit for extended periods of time with the spine in a state of alignment, for connection to higher awareness in meditation. It didn’t take long to realise that this was the tip of an iceberg of knowledge that Simon Thakur tends to keep below the surface. Thakur draws from his experience spending extended periods of time studying ancient practices in their home cultures, including traditional Svastha Yoga in India and Xingyi in Taiwan. His philosophy of 90% practice, 10% talking about practice has thawed a little in recent years and I was fortunate enough to see him present a public talk earlier this year which shared some of the pillars of the practice he has developed known as Ancestral Movement. It’s a combination of ancient traditional practices, cutting edge developments in neurobiology and evolutionary theory as well as a deep respect for… well… playing like a monkey. Here’s a quick summary of what I learned at Simon’s talk, in February 2015. Inside my own body, I can feel my own breath, if I really still myself I can feel my heartbeat, and maybe even the pulse at my carotid artery. Beyond that, I can’t feel much – and this is common for most people living in the modern world. The foundation of yoga may be about waking up sensitivity to feel each individual vertebrae independently, but it also extends to building increased sensitivity to all parts of the body, both internally and externally. What science is discovering is that through our increased ability to feel our own bodies, we increase our ability to empathically feel the world around us. To understand how this works, we need to first get our head around bodymaps and mirror neurons. Known to neuroscience, psychology and cognitive science, bodymaps (such as those found in the somatosensory cortex) are the parts of our brain that electrically light up when we physically feel something, or when we think about feeling something. They’re called maps because the part that lights up for our hand is right next to the part that lights up for our arm and so on. If a scientist was to stimulate one of these parts of our brain with electricity, we’d feel sensation in our body part, even though nothing was touching it. Neuroplasticity is our brain and nervous system’s ability to rewire itself according to what we focus our attention on. For example, as we practice a particular posture, the repetition creates more neural connections from the brain’s associated parts of your bodymaps. More nerve fibers are also created along the connection through the nervous system to that part of the body. As we do something more, our ability to receive more information about the subtlety of what we are doing increases. Mirror Neurons give us the ability to feel what it feels like to be doing something, simply by observing another person doing it. For example if someone waves their hand, around 15% of the neurons in our own bodymaps in our brain around our hand and arm of that area in our brain light up. The study of Mirror Neurons has widely been referred to as the science of human empathy. When we sit in a chair at school or in an office all day, every day, we lose flexibility and awareness in our spine as well as the majority of our body. On the other hand, when we do a practice like yoga, we increase the amount of neurological detail in our body maps and our nervous system. We can feel more subtle detail within ourselves. Because there is a larger volume of wiring that has been built up in our nervous system, so we can feel more information. This also means that as we increase the volume of neuronal detail in our bodymaps, the 15% that behave as mirror neurons increase and 15% of a larger volume of neurons is a larger 15%. By feeling more detail within ourselves we increase our ability to feel empathy for others. Perhaps the most profound element of Simon Thakur’s Ancestral Movement practice is the recognition that humans have been exploring physical movement as a necessity for survival since long before recorded history. He theorises that the more we participated in practices like animal mimicry, the more we were able to understand our environment through our internal mirror neuron response, feeding us vital information about food, hunting and the natural world. “If we take the spine as an example, and we practice movements that open up every segment of the spine, so the spine is free to undulate, rather than the spine moving as a rigid block, you’re going to experience empathy in the sense that you feel in your body as if you are doing the movement yourself whenever we see a moving spine. The realisation I walked out of Simon’s talk with was that all of the indigenous cultures that speak of being part of nature and not separate, now have a biological basis for this very real animistic belief.